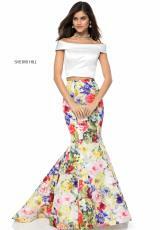 Stay on trend and rock this ultra chic two piece style 52005 from Sherri Hill to your senior prom. This stunning ensemble features an ivory, satin crop top with dramatic off the shoulder neckline, cap sleeves and keyhole open back. The magnificent mermaid long skirt is made is a vibrant printed floral fabric with back sweep train. See more phenomenal Sherri Hill gowns at Peaches Boutique.